Есть вопрос для Champeysar Guesthouse? Расположенный в Кампот Сити Центр, Champeysar Guesthouse это идеальное место для начала знакомства с Кампот и его окрестностями. Благодаря удачному расположению всего в 1 km от центра города, гости могут наслаждаться близостью к городским достопримечательностями и центрам развлечений. Гости отеля могут насладиться посещением популярных достопримечательностей города, Карусель Дуриан, Улица старого рынка, Массаж и Спа Golden Hands. Воспользуйтесь богатым выбором услуг и первоклассным сервисом в этом отеле города Кампот. Отель предлагает доступ к широкому спектру услуг, в том числе бесплатный Wi-Fi в номерах, обслуживание номеров 24/7, Wi-Fi на территории, парковка, обслуживание номеров. В отеле 16 прекрасно оборудованных номеров, с доступом к таким удобствам, как телевизор с плоским экраном, Wi-Fi, Wi-Fi (бесплатный), кондиционер, услуга будильник. В отеле можно найти полный спектр услуг для отдыха и развлечений, в том числе массаж. Champeysar Guesthouse идеально подходит тем, кто ищет необычный, комфортный отель, с удобным расположением в Кампот. Возраст гостей не должен быть меньше 5 лет. Небольшой гестхаус в центре Кампота. Чистый отель с хорошими номерами, очень вежливый персонал, на рецепшене парень очень хорошо говорит по английски и всегда готов помочь с арендой байков, покупкой билетов в другие города и организацией экскурсий. The guesthouse is more like a hotel. The room was very clean and spacious. The fan room gets really hot at times. The staff is nice and checks if you really stay in the hotel. The location is in walking distance to all the main restaurants and the Durian roundabout and the night market is right around the corner. If you book here ask for the room on the top floor. The view from the terrace is great plus you can go on the roof!! The downside is that there is no elevator and there are a lot of stairs. Friendly staff, clean, affordable. The room was really good for the money. We ended up staying 2 nights. The hotel is relatively clean and the rooms are accommodating. Beds are comfortable and shower set up is small, but much like other places though. You have to stand over the toilet in many rooms while showering. There is a young man that lives on the couch in the entry and runs the front desk. As soon as you no longer need his services, like your room key, he slips right back into his couch, which was kind of funny. He first sent us up 5 flights of stairs with all our gear to room 402 ( very top floor) only to open the door and find someone was already staying in that room, lol. Back down 5 flights for a second key to just the second floor this time. Pretty sure he got a good laugh at that one, and this also ensures that we kept our room key, just incase he wanted to hand it out to others. The hotel is in a great location close to the night market ( which has everything you see in all the other markets in Cambodia). The best part is it's a quick 5 min walk to the river and all the good restaurants. Dumplings and noodles are awesome and Rusty Key Hole and WonderBar. There is a guy that sells tours and bus tickets on the corner by the bars. Watch out for him, shady character that will sell you something over priced and maybe not even available while patting your back when your trying to eat. We took a tuk tuk to the caves, which were amazing and fun. Try to get an English speaking one, it's worth the extra $5.00. Ours had us half way to Kep before we stopped him and told him 'caves' not 'Kep'. It was a fun adventure, but the extra time costs us another day in Campot instead of catching the buss. A balcony room was confirmed buy on arrivel they were all occupied. On 4th floor with no elevator. Took room without balcony. Was ok. TV sound bad and noisy. Room and toilet were really small but maybe two adults and two kids are too much for 2 persons room. Staff were really friendly and helpful. Big windows, spacious rooms , all clean and sparkling ,TV ,bathroom ,everything needed . best value hotel ever stayed in in Cambodia. Ever. Best hotel to date I stayed in over years I gave been travelling to Cambodia .New so clean light and airy .lovely place and amazing long cheap. Really enjoyed our stay here, the manager, Sareth, was very friendly and helpful - his English is perfect and he has great tips for things to do. Would definitely stay here again if we return and would recommend as a great place to stay. The water from the sink drains right through the toilet floor which is strange. Otherwise I had a good stay there thanks to the friendly staff. Room was clean albeit small. There is a really good pie shop down the street and I wouldn't give it a miss. the boy behind the desk sprake english very welk andere was pro active. the room was big enough andere clean. the beds were comfy and the hotel was located near all the restaurants andere the river. Very good and pleasant. This is a cheap hotel but comfy. No extra's like a restaurant or a place tot relax but this you van vind near the river that is close by. BED BUGS : during the night we could see bed bugs on the bed. We ask the staff to change the room, but because of his bad engkish, that was difficult to be understand. Finally he came to see, but he didn't know what was bed bugs...we had to ask many time if we can change the room. After one hour, we change and no insects in that one. If you are in one of the two rooms on the last floor, you should change, because for you they won't change the matras. In the others rooms down, there are no problems. It's a shame, because the hotel is nice, the room confortable and clean and the staff is nice. Also, they give us a very nice tuktuk driver to visit some parts. The staff were amazing, very knowledgable, helpful and friendly. It was within walking distance to the river and very quiet at night. 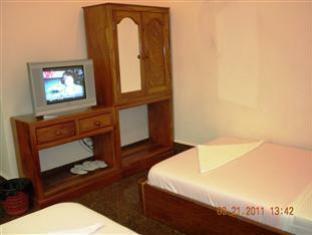 It is a Khmer owned hotel and the rooms were very comfortable. The bathrooms have the shower going straight onto the floor so the bathroom is always wet but that didn't bother us as we have lived in a flat like that before. It is good value for money. Couldn't fault it at all for what we paid. Central location, the friendly and helpful staff and the cleanliness of the property. We arrived at the Guesthouse later than expected after another botched trip on a Sorya bus. As we had booked a fan room we had to climb 5 floors to the roof but that was compensated by having a large room with large bathroom, a terrace with views of the river and great views of Bokor mountain. A small table and a couple of chairs on the terrace would be a great addition! The whole building was very clean. OK for a night or short business visit. For similar prices, Kampot has plenty of charming, pleasant hotels with great atmosphere to make your stay memorble. Room was not clean, smelled bad and used water passed through the bathroom. The hotel is in good condition and the reception man was very helpful.